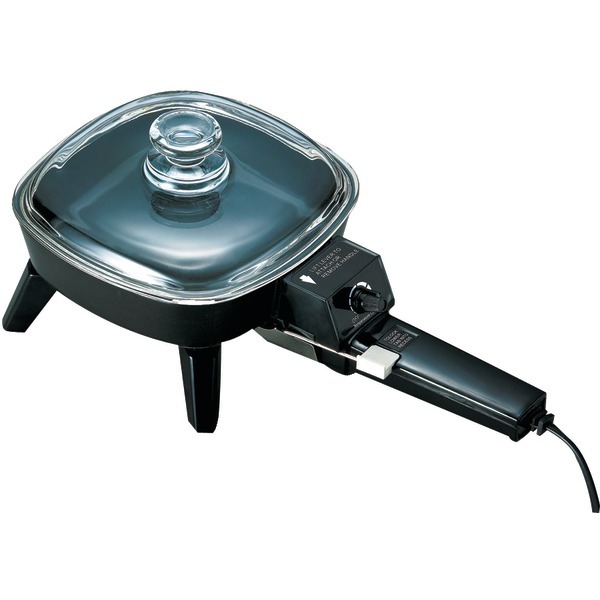 Electric NS Skillet 12" Electric NS Skillet 12"
This family-sized 12" 1 300-watt Electric Skillet with Glass Lid from Brentwood Appliances has a non-stick coating for easy cleanup. The SK-65's see-through tempered glass cover lets you safely see what you are cooking without the contents splattering all over the countertop. The cool-touch handles means no burned fingers should you touch the handles. 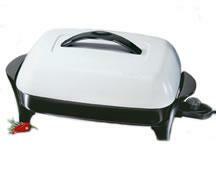 The thermostat control is adjustable and the power supply detachable. Weight: 6.15 lbs. 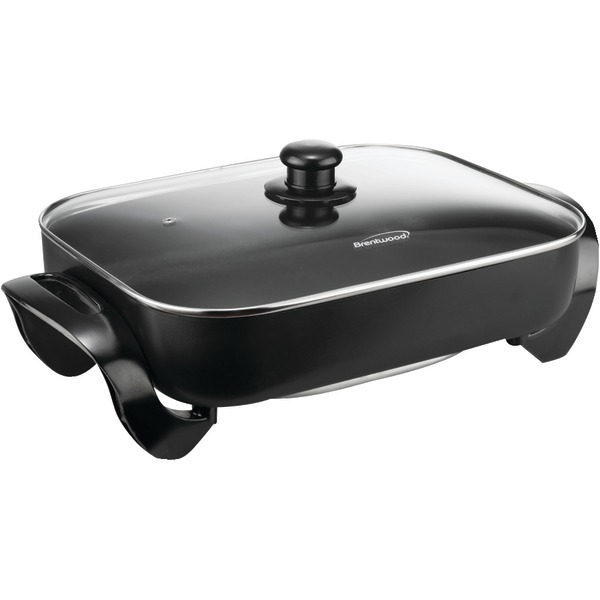 7"H x 18"W x 12.25"D black finish cUL. This item cannot be shipped to APO/FPO addresses. Please accept our apologies. 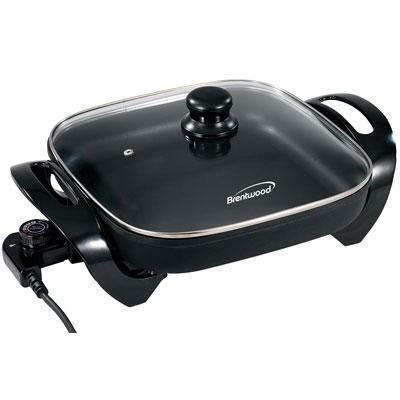 Jumbo size 16" Electric Skillet with high side-walls for extra cooking and serving capacity. 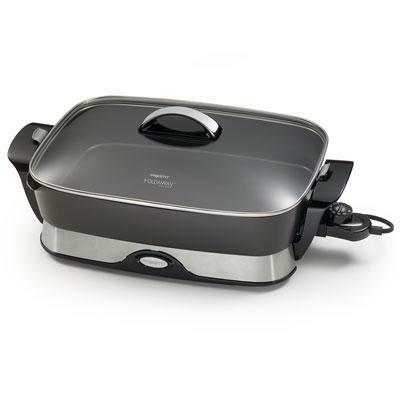 Roasts fries grills stews bakes makes casseroles and more. Fully immersible with heat control removed for easy cleaning. This item cannot be shipped to APO/FPO addresses. Please accept our apologies. 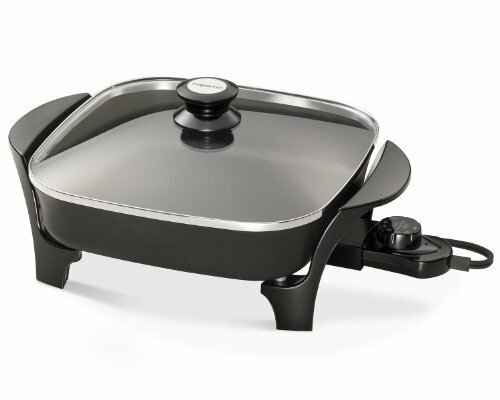 Black & Decker Skillet features a large cooking area and deep interior for healthy cooking for the whole family. 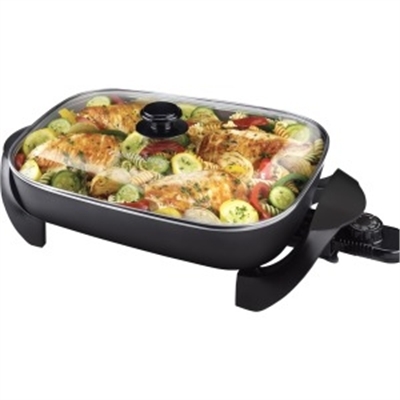 Go from kitchen to dinner table with the quick-release variable temperature control and cool-touch handles - perfect for table serving. 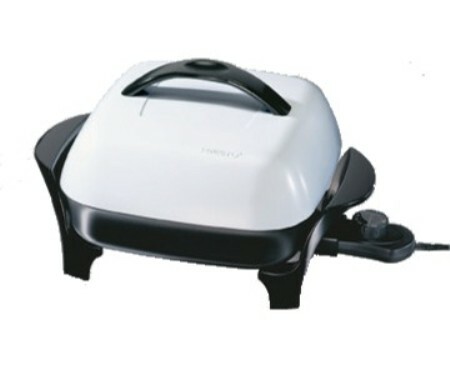 Excess fat is removed with the pan tilt leg to move oil and fats away from whatever you're cooking. 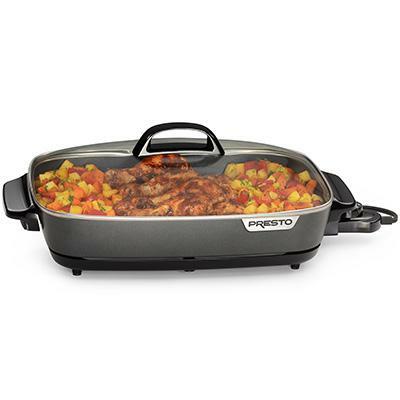 Features include a 12" x 15" cooking surface with durable nonstick coating for easy clean up removable variable temperature control ranges from keep warm to 400 degrees F dishwasher safe base cool-touch base with serving handles tempered glass lid. 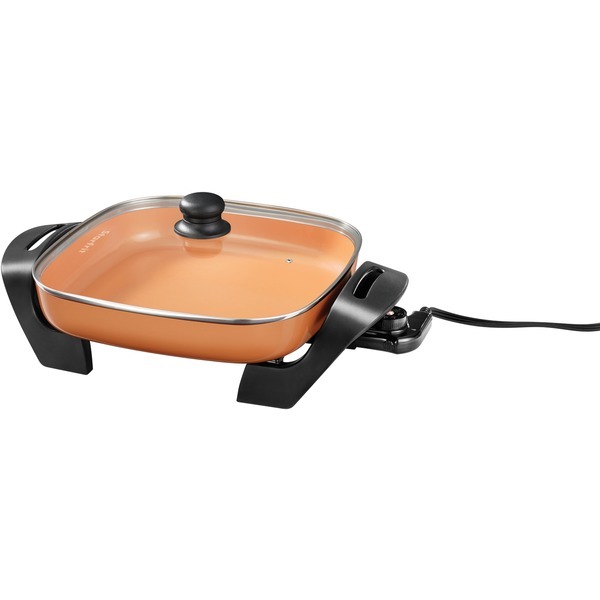 12" x 15" x 2" deep cooking surface great for family cooking or entertaining buffet style Quick-release variable temperature probe releases quickly for serving and cleaning. 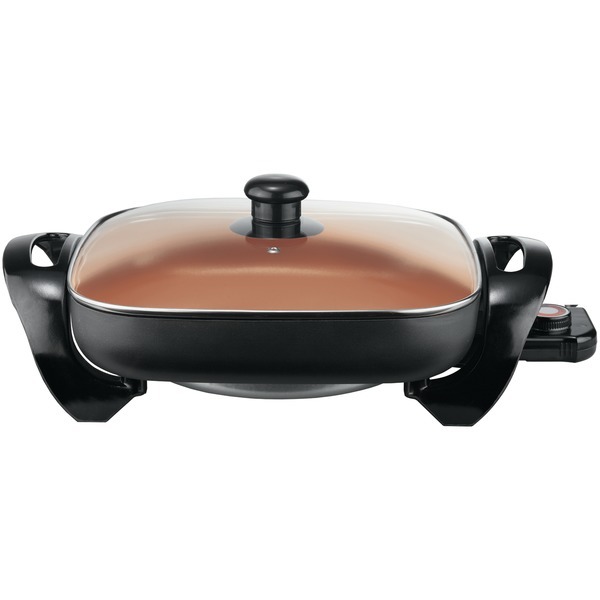 Non-stick coated surface. 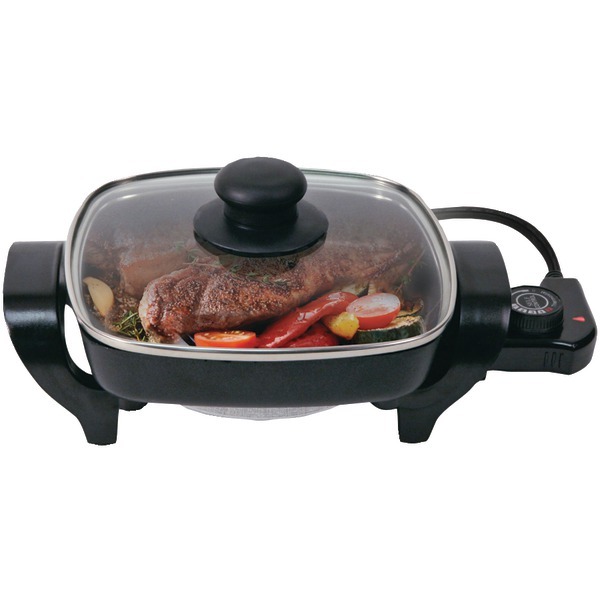 Easy to use dial control can be turned low for a keep warm setting. 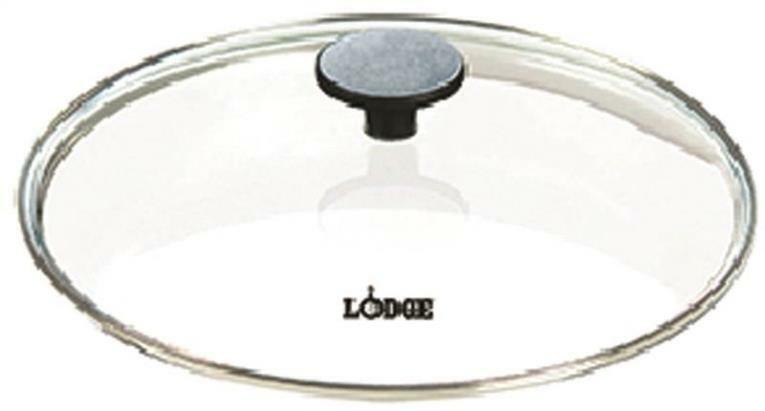 Tempered glass lid allows you to view cooking progress. Black. This item cannot be shipped to APO/FPO addresses. Please accept our apologies. 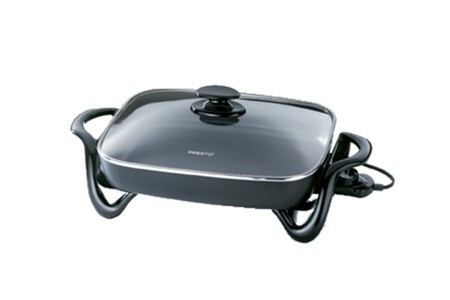 Nesco Electric Skillet w/Lid8" Nesco Electric Skillet w/Lid8"
Nesco Black 8" Electric Skillet with Glass Lid has a deep interior for roasting/frying easy to read adjustable temp control with a heat resistant-stay cool handle. 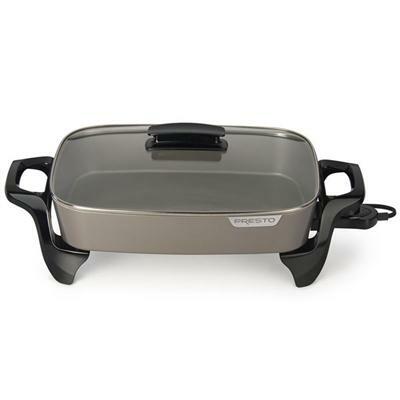 Skillet and lid are dishwasher safe and the lid is sturdy with a knob and safety vent. The non-stick interior makes for easy clean-up. In Box: Cooking skillet Temperature Probe Glass lid. This item cannot be shipped to APO/FPO addresses. Please accept our apologies.